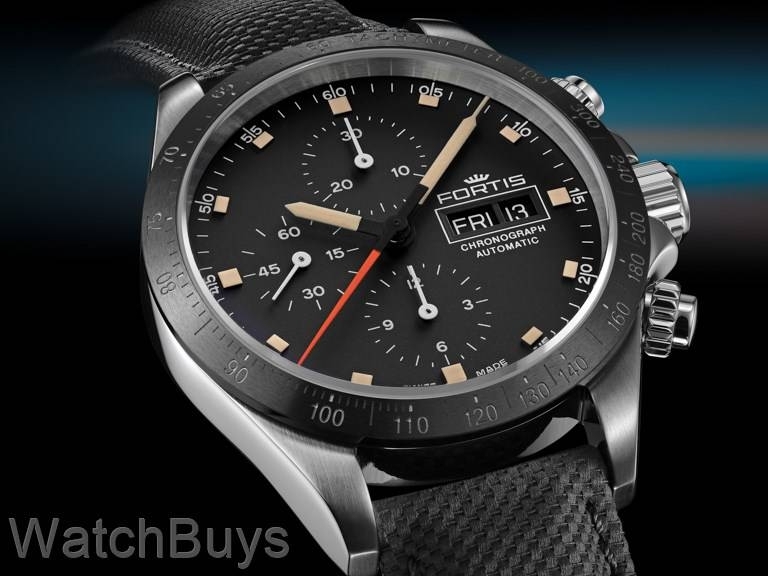 The new Fortis Stratoliner series is designed to handle the rigors of flights in the earth's stratosphere, 15-50 kilometers above sea level, which is why this watch merits the title of a Cosmonautis. Dating back to the early 1960's, the Stratoliner Collection has been used by pilots during reconnaissance flights at altitudes of 20,000 meters and above. The Fortis Cosmonauts Stratoliner Chronograph Ceramic PM features a 42 mm case with complete chronograph functions. The dial is matte black (hence the PM in the name of this watch), with the hour and minutes hands colored in beige with applied SuperLuminova and a red seconds hand. Accentuating the dial are applied numerals and indices, also coated with SuperLuminova. Screwed pushers drive the chronograph, which features an orange central chronograph hand and subdials at 12 and 6. The matte black ceramic bezel perfectly complements the case design and finish, providing balance to the watch as a whole. Integrated into the bezel is a tachymeter which can be used for speed calculations. This watch is fitted with a Fortis black leather performance strap with black stitching and tang buckle.